The new Bishop of Durham is to be current Bishop of Southwell and Nottingham, the Rt Revd Paul Butler. Commenting in advance of today's announcement Bishop Paul said that he was very much looking forward to coming to the North East and continuing the work started by the previous Bishop of Durham, The Most Reverend Justin Welby, Archbishop of Canterbury. He said: “To be called to become Bishop of Durham came as a big surprise but is a huge privilege for many reasons. This ancient Diocese goes way back before England was a united nation. The heritage is extraordinary; each new Bishop of Durham stands on the shoulders of some of the greatest Christians in this country’s long and proud history. “It will be very sad to leave Southwell and Nottingham, the work that we have begun there will continue and I am sure in time will be taken up by a really good and inspirational bishop able to take the Diocese from strength to strength. “I am delighted to be coming to Durham and the North East at a time of significant change that is both exciting and challenging in equal parts. I come here to serve and to seek to enable the continual renewing of the faith and our engagement with all people in every community”. 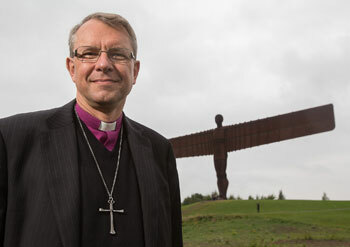 Although not from the North East, Bishop Paul will come to Durham with a keen interest and understanding of the issues and the geography of the region. He said: “I come here deeply aware of the challenges faced by the community and the church. Although I am new to the area, I have visited the region’s universities both in my work before training for ordination and on my Journey of becoming a bishop in the Church of England.